Andrew Jordan claimed his third BTCC victory of the 2017 season with a composed performance in a scrappy third race at Rockingham. Jordan started the race pole, but faced fierce pressure from a chasing pack of six cars for much of the race before easing clear after a late-race safety car. The WSR driver converted his reversed-grid race pole into a first-corner lead, but was immediately pressed by the Ciceley Racing Mercedes of Adam Morgan as he worked to bring his BMW’s tyres up to temperature. Jordan survived an attack from Morgan into the Deene hairpin at the start of lap four, with Morgan chancing his arm around the outside before tucking back into second ahead of Jack Goff. 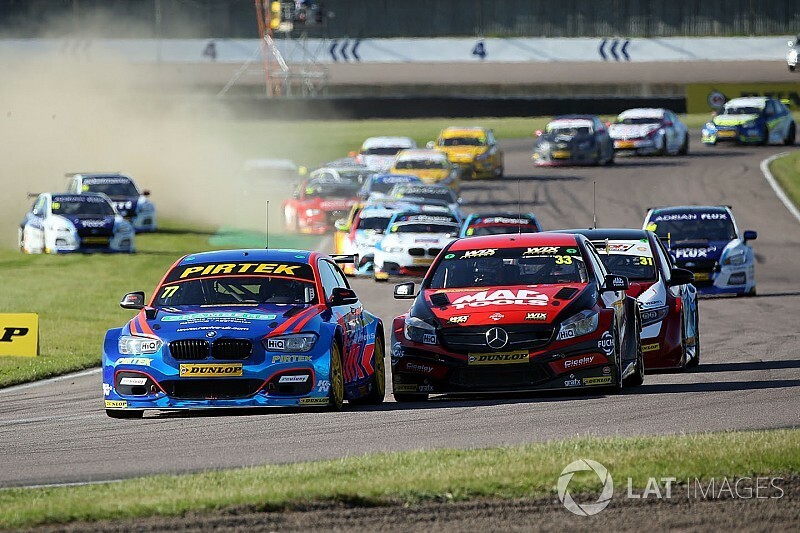 The three-car fight soon turned into a seven-car lead scrap, as the ensuing Jason Plato and Rob Collard and battling Tom Ingram and Colin Turkington caught the lead trio. But as had been the case in Sunday’s earlier races, the tyres on Goff’s Eurotech Honda began to fade and he was soon dropped by the leading duo, who had pulled 2.4s clear of the chasing pack - joined by Ash Sutton after a difficult opening lap in his Team BMR Subaru - by lap 10. That margin grew for the next couple of laps, but was wiped out thanks to an incident in the secondary pack. Collard had overtaken Plato for fourth off the Tarzan hairpin on lap 12 and a lap later appeared to have got the best of Goff at the same spot, but as me moved over towards the racing line for the Brook chicane the pair touched, sending Collard into the barrier along the track before ending up in the gravel. Jordan bolted on the restart after a single safety car lap and raced home to victory, but the neutralisation of the field meant Plato - who had cleared the delayed Goff in the previous melee - was able to attack Morgan in the closing laps, as Goff once again fell away. 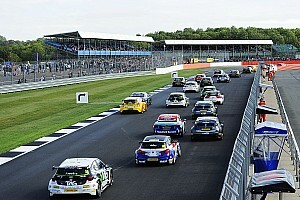 Morgan was able to hold onto the second, however, and scored his first podium since the Donington round in April. 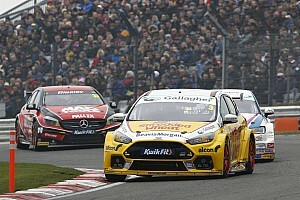 Goff clung on to fourth with what little tyre life he had remaining, while Sutton beat main title rival Turkington to fifth to bolster his championship lead. Senna Proctor was an impressive seventh in his Power Maxed Racing Vauxhall, having passed Ingram in the final laps, while BTC Racing pair Chris Smiley and Dave Newsham completed the top 10 in their Chevrolet cars. Gordon Shedden scored his first points of the weekend with 12th, but is now 55 points behind leader Sutton with six races of the season remaining.